The broad aim of effective engagement with non-members, including developing countries, industrialised countries, other international organisations and interest groups, especially in the pursuit of economic development, was laid down in the OECD’s founding Convention in 1961 (OECD 2013). The aim of this paper is to examine and compare two of the efforts of the OECD’s Development Assistance Committee to engage with the Arab donor states. The first effort was in the 1973 to 1990 period. The second, more recent effort began slowly in 2009 and continues at the time of writing (2013). The paper is based for the most part on OECD publications, including recently de-classified archival material and on the personal files of past Secretariat officials such as Jurgen Bartsch, Helmut Fuhrer and Ruth Stock. It is divided into two major parts. The first, ‘1973-1989: the first engagement effort’, examines the background to and the motives for the first engagement by DAC, as well as the processes involved and their outcomes. The second, ‘2009 to date: a revived but uncertain engagement effort’, provides a similar examination of the background, motives and initial outcomes of the second, revived engagement effort. It is an effort that is not yet complete and the authors’ conclusions must be regarded as tentative. It concludes that DAC’s two engagement efforts in relation to Arab donors were not the result of a process of systematic planning aimed at clear objectives. In the 1970s they sprang from the fears engendered by the two oil crises, as a largely ad hoc response to very challenging circumstances, with limited, active support by DAC members and a very limited budget. 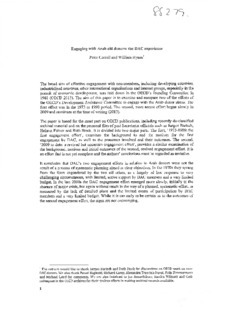 In the late 2000s the DAC engagement effort emerged more slowly, initially in the absence of major crisis, but again without much in the way of a planned, systematic effort, as measured by the lack of detailed plans and the limited extent of participation by DAC members and a very limited budget. While it is too early to be certain as to the outcomes of the second engagement effort, the signs are not encouraging.